If you saw my post yesterday, you know that today is the first in a series of posts about the Chic Chateau Showhouse in Greensboro, NC that I recently was able to tour and photograph. Grab a cuppa something, sit back and enjoy! First up is the foyer and living area of this home build by R&K Custom Homes. 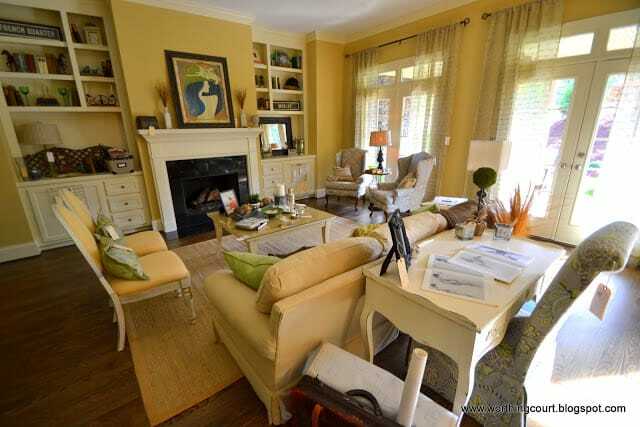 Designed by Sherry Sarine, SSI Design Group, Inc. 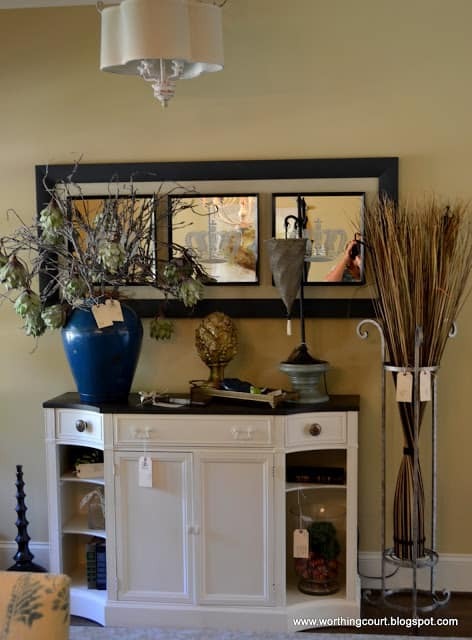 In a small foyer, use a simple long wall-mounted shelf or mantle with a mirror or piece of art above it. Use some floor plants under it to make the arrangement feel grounded. 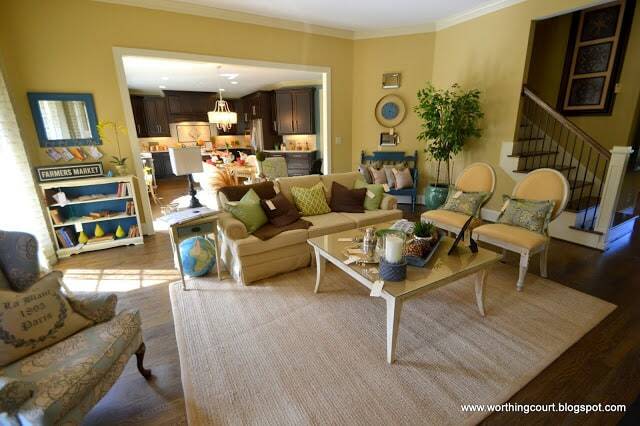 Use a dynamic area rug, but make sure it coordinates with rugs in adjacent rooms. When combining different pieces of furniture, use upholstery or color to unify and connect them. 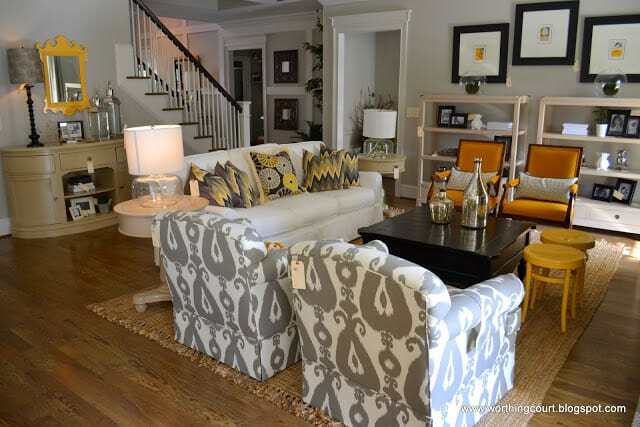 Trendy, bright fabric can change up a dated piece. 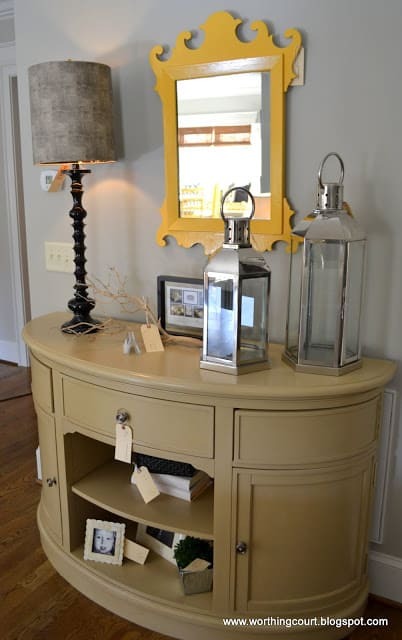 Look for uniquely shaped mirrors and accessories at a consignment shop. Apply a high gloss paint, add some black picture frames and you have an instant bookcase design scheme. 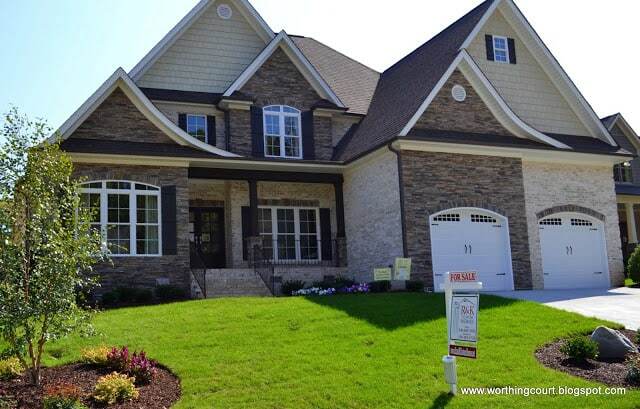 Next is the foyer and living room in this home built by D. Stone Builders, Inc. 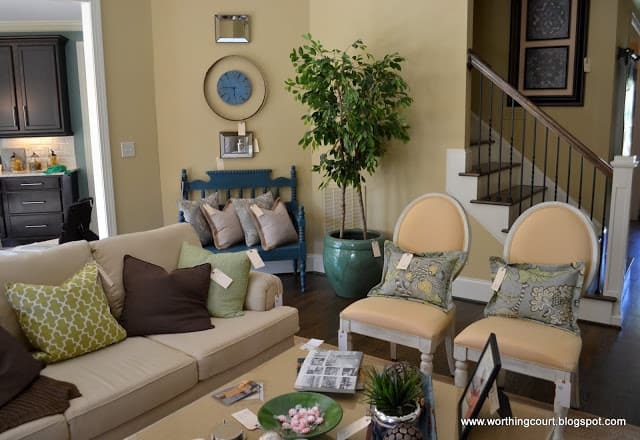 The foyer is the first impression of any home and must speak of what is to come by introducing the design and color scheme for the rest of the home. Not everything should match, but it should coordinate and blend together using a layering technique. Start with one piece that you love and build the room around it. 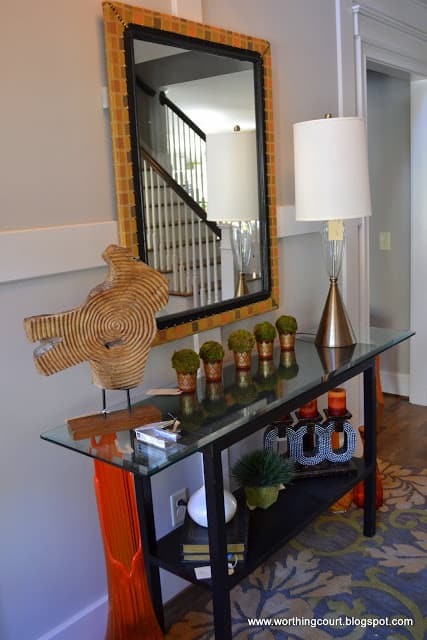 Use accessories to imprint your personality into the room. Thnaks for the tour Suzy…beautiful rooms…love the foyer table in the second home…Now I am assuming that all of the furnishings and accessories are for sale, as I see tags…I have purchases quite a few things from Showcase homes…always for a great cause!…..Can’t wait for the rest of the tour!! 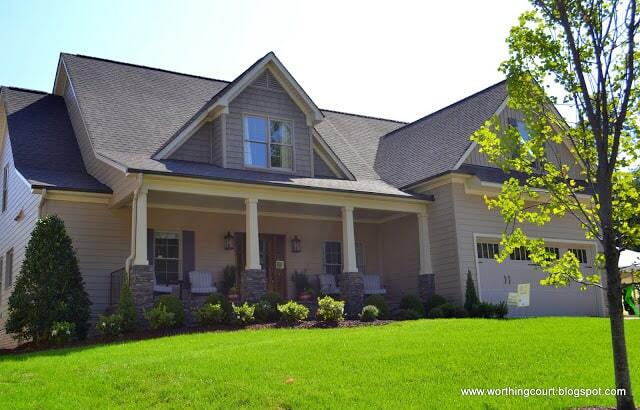 Oh I just love to look at Southern homes. My grandmother was from Greensboro, we visit there every summer. Everything is just beautiful.. I am now your latest follower. Thanks for sharing I love the wingback chairs with the pillows. This was a great tour. Suzy, I love the colors and the mix of classic and modern… what a great look! 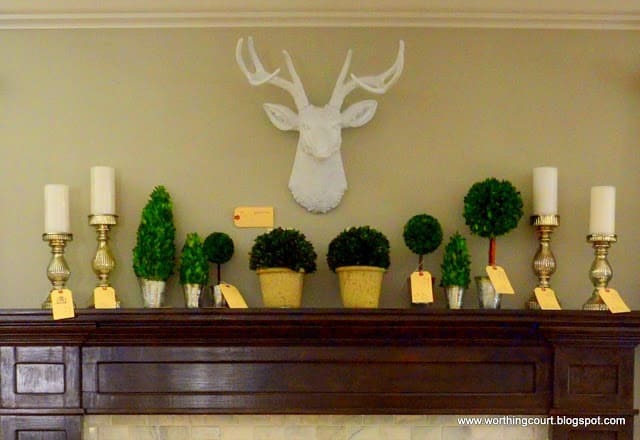 I need to copy that mantle!!! So pretty! Suzy, fantastic post and beautiful photos! Thanks so much for featuring the Chic Chateau homes. 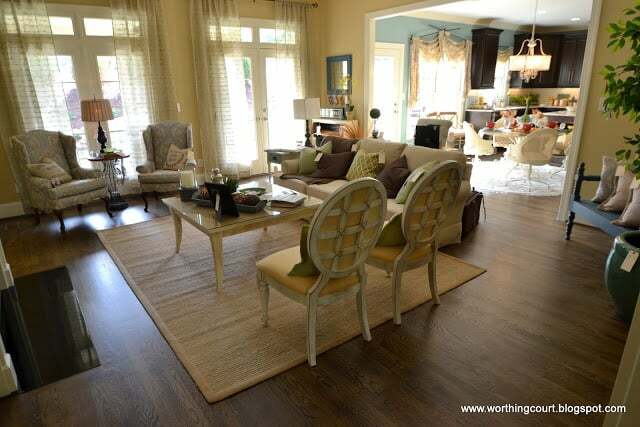 Several items in the photos are still for sale, including the chairs/sofa featured in the R&K House. 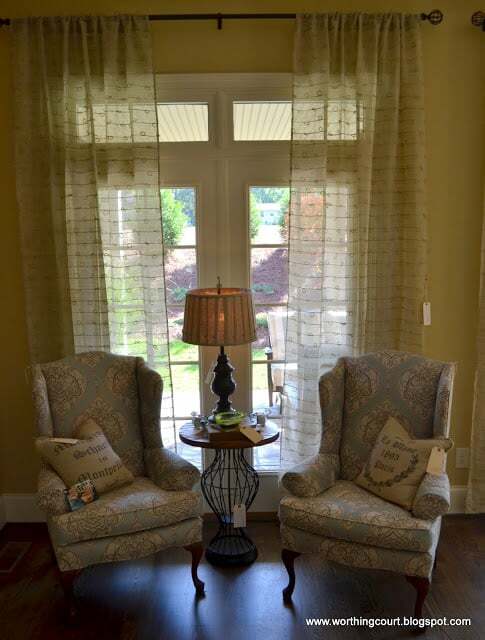 The furnishings sale ends tomorrow (Sunday), so if you’re in the Triad and haven’t checked this out yet, be sure to do so! Suzy, I am so happy I found your blog through the everyday home blog!! I wanted to go to Chic Chateau Soooo bad, however, I couldn’t make it. So I was super duper excited to see your pics from the event!! Thanks for the tips to get the looks too! I am looking forward to your upcoming posts! Suzy, this was a great tour! I love their use of color and the mix of styles! This is such a lovely home…full of inspiration! Great inspiration! 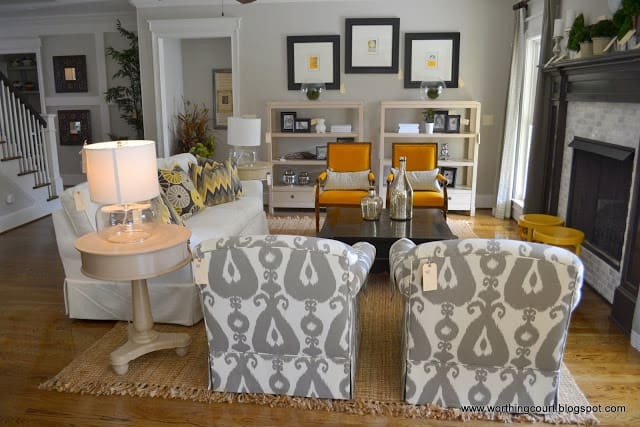 I am so wanting the gray and white chairs in the first home! Gorgeous! I love the dark wood fireplace mantel with the light stone tile-such a striking look! 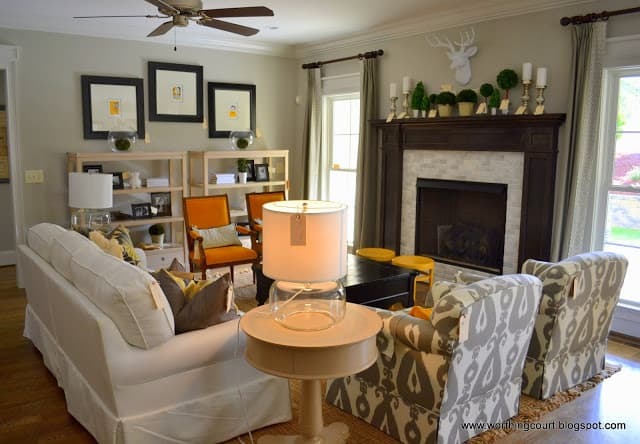 Just went to our local Homearama last weekend – I love these tours!! Such a great post. I used this one instead of your bathroom this week in my features because I am thinking we will be using your bathroom in my feature of design bloggers next week. Thanks for linking up. I love a Showhouse tour. I will be featuring this tonight at my Fall into Fall party that opens at 8pm EST. Please stop by and pick up an I’ve Been Featured button. Thanks. Thanks for this lovely tour. I love the lamps in the first living room. They were large glass bases. Everything was so gorgeous. I really enjoyed the tour. The house is gorgeous with all it’s decor. I always get inspired when I take a tour. Thanks for sharing. Hi to every , because I am truly eager of reading this weblog’s post to be updated regularly. It carries fastidious stuff.